Bangladesh is located on a floodplain of three major rivers and their tributaries. One-fifth of the country is flooded every year, with up to two-thirds in extreme years, due to variability of rainfall and snowmelt, and storm surge from the Bay of Bengal. The 1998 flood inundated 100,000 km2 of land. 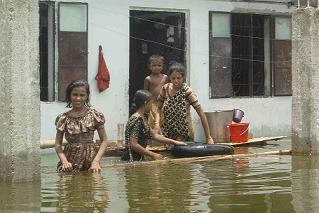 More than 30 million Bangladeshis were displaced, with 20 million homeless. Hundreds were killed, with thousands of cases of dysentery diarrhoea were confirmed.